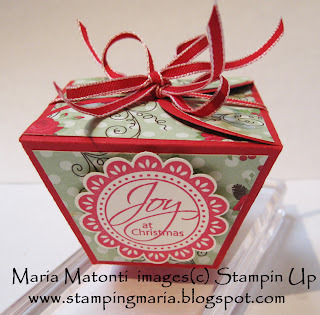 I made this CUTE and QUICK Take Out Box using the Stampin Up Petal Cone Die. This box was around everywhere last year, but I still LOVE it! I decorated it with the beautiful Holly Berry Bouquet Designer Series Paper to give it a holiday look. I die cut 2 petal cones using Real Red cardstock then measured at 3" from the top score line and cut off the bottom cone tip. After that, I measured 2" from the same top score line and made a score line to create the box bottom. If you'd like to see a video, please let me know. Accessories: Big Shot machine, Petal Cone Die, 1/8" red taffeta, 1 3/4" Circle Scallop Punch, Sticky Strip, SNAIL, and Dimensionals. Thanks for visiting and have a great weekend! Don't forget that October 31st is the last day to take advantage of the Big Shot sign up special! Believe me, it's worth signing up just for the Big Shot Machine!